Two Australians walk into a bar after 8.00 pm on a Tuesday. Everything else within proximity of their hotel seems to be closed, but this one has a flashing OPEN sign and seems to indicate it’s a dining and drinking establishment. The four customers at the bar, enjoying cigarettes and their own bottles of sake which the bar retains for them, turn their heads simultaneously. This is not a usual occurrence in this side street of Izukogen. Still, the barman calls his wife who emerges from the kitchen with the Japanese word for welcome. The two are seated at one of the two tables. It is explained to them by one of the bar patrons that this is mainly a bar, and only a set meal is served. “That’s okay”, the visitors say as they order one set each and a beer for the non-driver. It is busy in the kitchen if the emergent sounds are anything to go by. The drinks arrive and soon, an egg salad appears. The food keeps coming. Yakitori next, followed by more beef than these two have seen for the past 4 weeks in Japan. Fried rice accompanies the feast. In between courses, the host runs through some cities in Australia she knows. When they zero in on Brisbane, she mentions jacaranda trees and the time of year they flower. Someone is diving into her Japanese notes to keep the conversation flowing. A dessert of watermelon and orange pieces finishes the meal, followed by a “presento” of non-alcoholic beer for the driver. The couple is us, and we were made to feel most welcome. This was no set meal that our host prepared. This was Japanese hospitality. We left with bows and hugs and a photograph of another memorable night in this country. Dining Bar, Mitsuko. Izukogen, Japan. 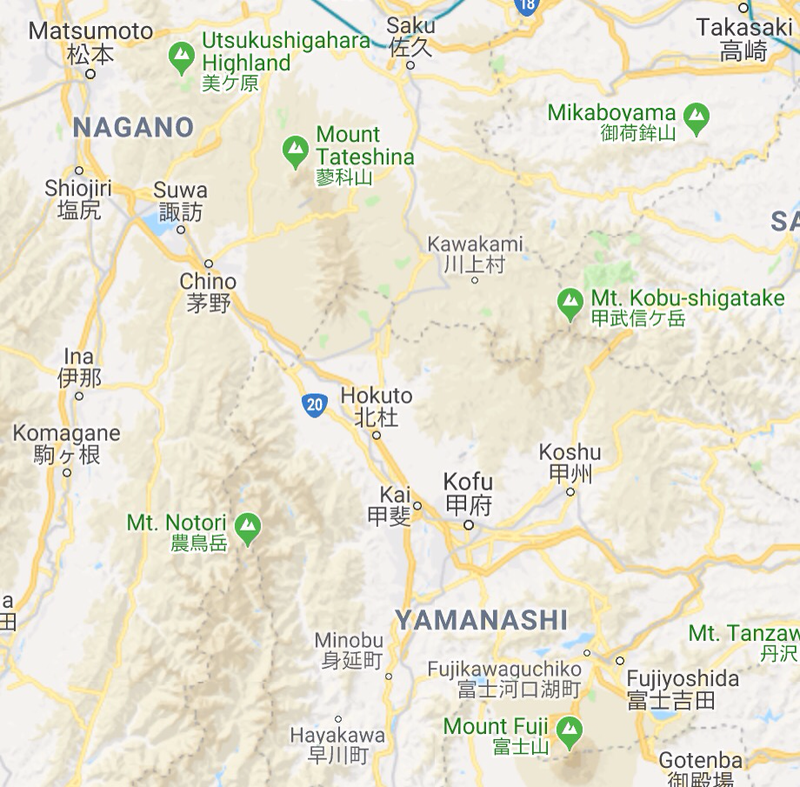 Today, we drove from Matsumoto in the top left corner of this map to a place called Kawaguchiko which is a little north of that mountain in the centre bottom of this map. Yes, that mountain. This place is stunningly beautiful. We are staying beside one of the Fuji Five Lakes and my travel agent (also known as Himself) has exceeded all expectations in finding this place, across from which Mount Fuji soars. EVERY room has a view of the mountain. We were extremely fortunate to arrive on an afternoon of full sun and a clear sky. There is a walkway around the lake where you can take in Fuji San, watch boaters and recreational fishers and birds looking for a feed. I will let the landscape tell its own story via these photographs. Meanwhile, we are here for dinner and breakfast, and settling in for the night.